All right, tea! It’s this post-Christmas time of year that Teavana digs out what’s left of the year’s batches of tea and puts them on sale for 30-75% off. It’s a good time to stock up if you find a favorite listed. And it may be a good time to try something new too. Keep in mind, some of the sale teas will be discontinued (most of the tea that’s 75% off), so when these are gone, they’re gone. (I’ve added a partial list of discontinued teas to the end of this post.) It’s good to stock up if a favorite is listed. Some tea is just marked down to make room for fresher batches, so why not try a new blend or some black tea pearls? You can not only find tea on sale but also lots of tea ware such as tea pots, tea strainers, mugs, and travel tumblers (many of which come with their own tea strainers). One of my favorite styles of travel tumbler is on sale, the Stainless Steel Tea Tumbler. They call it the “Chai Tumbler” on the website, who knows why “chai,” but you can use it for any kind of tea. A similar model was called simply, “Stainless Steel Tea Tumbler.” Since my old version has lost it’s vacuum seal, and no longer keeps the heat as it once did, I might have to grab a new one. This is my favorite because it doesn’t have a push-button on top (those are hard to clean properly). The one I like has a regular screw-on lid that doesn’t leak and is easy to clean. When mine was newer and insulated properly, tea could stay hot for 6 hours (and warm for even longer). The Teavana store at our mall has this same style of Stainless Steel Tea Tumbler, but different patterns on the outside — one is somewhat holiday specific with words like “tinsel” and “twinkle” emblazoned on a white matte finish, the other is a shiny ombre cranberry red. 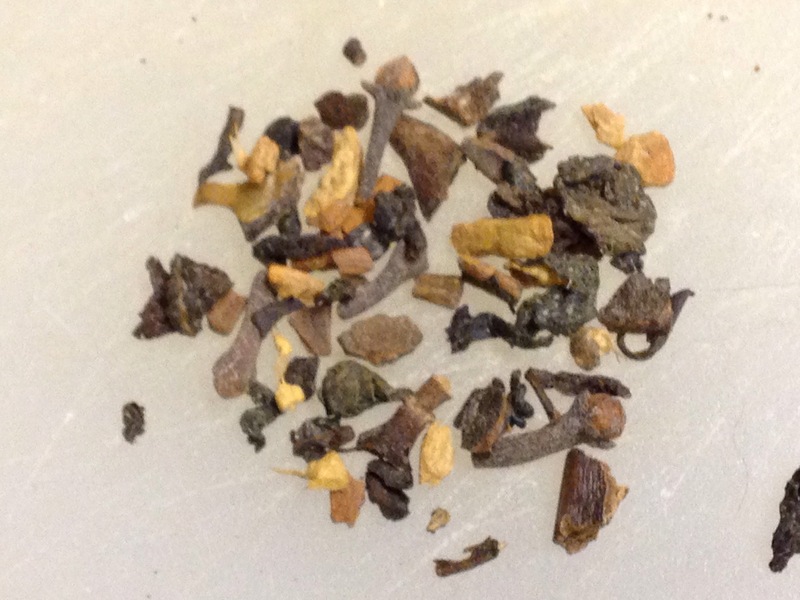 Also on sale for 50% off is the ever-popular Maharaja Chai Oolong tea. It’s a flavorful, well-balanced chai made with oolong instead of the more traditional black tea. Oolong is less likely to get bitter and adds a hint of floral fruitiness to the mix. In this chai, I note pepper, cardamom, ginger, and cinnamon. Also present is nutmeg and cloves. There’s something that almost sparkles on the palate — a mint-like sensation without any mint. And it’s all mellowed out by the addition of carob (with it’s chocolate-like taste) and chicory for a smooth richness. It has a fair amount of natural sweetness without adding sugar or honey, but you may prefer to add some if you like your chai sweet. Keep in mind that temperature, how much tea you use in a cup, and brew time make a huge difference in taste, and I especially find that to be true with a lot of chai blends. The volatile components release at different temperatures. If you don’t like it at first, try brewing it differently. Or if chai is too spicy for you, mix it with a little plain tea of your choice to pump up the tea and bring the spice down a few notches. This is one of those few chai blends where none of the spices seems to overpower the others. It becomes a new whole. A really yummy whole. Nice on a cold winter’s day (which, hopefully, we’ll get a few of). Updated to add this note: The discontinued teas include Acai Matetini Mate tea, Toasted Nut Brulee Oolong tea, Tomato Lime Cocktail, My Morning Mate, Grape Wulong Oolong, and Marshmallow Macaron. I’m guessing there are a few other discontinued teas that they simply didn’t have in stock. The list is usually longer. Many of these are no longer offered online, but you may find an actual store with some of these (or others) still in stock for a VERY limited time. Also, the sale on non-discontinued teas probably ends on January 3 January 10. Traditionally, they only have the sale once or twice per year, so act quickly if you’re interested. Lots of yummy teas are available. Local brick and mortar shops may have a somewhat different selection of sale items from those on the Teavana website. Teavana will roll out with new teas on January 11. Previous Merry Happy Christmas Next Happy New Year! We Aldi tried to stick up on some teas in the sale but they had all sold out on line boo. Hey ho, we will just have to get some new ones to try. They do sell out quickly during sales. If you’re interested in Maharaja Chai, there was some in the 2 oz size on the website this morning. The 1lb appears to be unavailable. Good luck with any new ones. I would love to hear what you like! And it appears to be sold out online now, but as of yesterday our local Teavana store had Maharaja Chai in stock at 50% off. They also had a number of discontinued teas in pre-filled tins ready for purchase at 75% off. I’ve revised my blog post to show some of the discontinued teas. I was able to come out with Acai Matetini — refreshing sour fruitty with mate and caffeine. I like to mix Acai Matetini with plain tea leaves. I also got some Toasted Nut Brulee. The pre-filled tins contained more than I’d normally purchase, but at 75% off the price is hard to beat. I would have liked to try Tomato Lime Cocktail tea, but the container was huge. It smelled a lot like V8 and probably tastes like soup when hot. I could see enjoying it iced, but no way do I need a giant tin filled with Tomato Lime tea. I might have liked to try Grape Wulong Oolong tea, but it really smelled like grape juice. I’d rather have plain oolong tea and add a splash of grape juice to add some variety. I read somewhere that oolong tea is great with greasy or fatty foods. It prevents the absorption of fats, allowing it to go right through – yay!